Today, finally, I placed my seed order. Ordering seeds always seems very daunting to me—like taking on the Impossible Project or maybe surviving a twenty-six-point-two-mile run. Spinaches and lettuces are, by definition, easy, Celeste says. Order what you think is tasty, or pretty, plant a bunch, and don't worry about it too much unless the weather gets outrageously sunny and hot. If that happens, give the plants some shade and some water, and they will soldier on. Depending on how you plan to plant your garden, it might be a good idea to buy some early and late varieties, and some that can stand the heat. This way you can be in greens all the time. 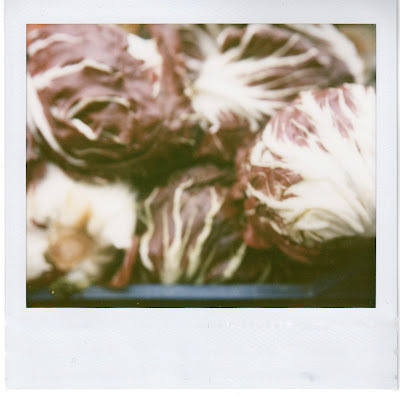 These are those pretty magenta and white swirled beets you see at the farmers' markets all the time. Celeste cooks sometimes at the soup kitchen in Provincetown, and last year, a local gardener donated a whole bunch of these. 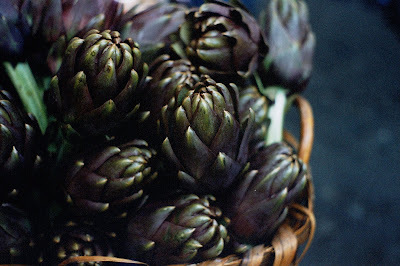 She says they were the hit of the season—wonderfully sweet just roasted with a little bit of oil and salt and pepper. Celeste likes these for slicing, because they are early, and prolific, and inside their bright white flesh is oh-so-crisp. They also grow long, and don't have too many spines. These are ideal for people who don't have much space, but want lots of cucumbers and lots of pickles. Celeste says they grow small (about four to five inches, a.k.a. ideal pickle length), and stay firm, even jarred. We grew Bright Lights Swiss chard in our garden last year, and I can attest to its fabulous-ness. We planted it twice, once in the early spring, and once at the end of August, and we have been in red-yellow-pink-and-orange chard from April through today. I know! Two plantings, a million cuttings, lots of salads, lots of stir-fries, a whole bunch of soups, one Swiss chard gratin, a whole lot of blanching and freezing, and several pounds of onions and garlic later, and we are still eating from a single pack of seeds. Celeste likes it because it's beautiful, and prolific, and easy, and as I just mentioned, about as versatile in the kitchen as one green can be. She found this recipe for goat cheese rolled up in chard leaves and grilled, which even without having tried it I feel I can heartily recommend. Pointsetta wins purely on cuteness. It's a new pick for Celeste this year, but she likes the way that the peppers point up instead of down, and are very bright and tiny and generally adorable. She's doing a demo garden for the new Wellfleet Community garden plots, and she says that when she saw this she simply couldn't resist. Believe it or not, Celeste recently had a Jalapeño plant that lived for five years. She says she simply planted it in a pot, and brought it inside in the fall and back out again every spring. Jalapeños are easy, and better yet, produce peppers that sliced in half, stuffed with cheese, and broiled, will bring you to your knees. At least not from seed. Rosemary and Parsley are both difficult to germinate, Celeste says, and not worth your trouble at all. Get them, but buy them already robust in little pots at the garden store. As for the rest, plant Oregano and Spearmint but watch out because they spread, and accumulate as many varieties of Thyme and basil as you can. Oh! and while we're on basil, Celeste thinks Genovese, the big, broad-leafed Italian variety is very nice, as are Thai basil and lemon basil. Celeste's last recommendation is just in case you decide that this year, you want to go big time. She has a sunroom on the south side of her house, and for a while now, she's been experimenting with tropical fruit trees. Based on my Valencia-orange-eating-in-February experience, I'd say it's been a wild success. In addition to the oranges, she's ordered and successfully nursed to maturity a Meyer lemon tree, a Ponderosa lemon tree (which produces fruit the size of baseballs! ), and several varieties of Italian figs. (The seeds for which her grandfather brought over from Italy.) She thinks that if you have a sunny room, you should go for it. There you have it—Celeste's top ten for 2010. Before I go, though, a few notes. You probably noticed there are no tomato varieties up there. 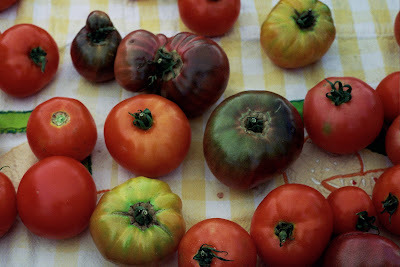 That's because next week, I will be bringing you another of Celeste's seed-ordering lists, this time ONLY for tomatoes. Yipee! And a note about seed ordering: Celeste orders most of her seeds from Totally Tomatoes, which carries both tomatoes and a few other plants, like hot peppers and cucumbers and basils. It's a great catalog for anyone, but maybe more so for a tomato zealot like Celeste than for the rest of us. I order all of my seeds from Fedco, a Maine-based company that I like because it a) sells only seeds adapted to our cold New England climate, b) is very committed to sustainable growing and non-GMO seeds, and c) has in its catalogs sections like "How Not to Order" and seed descriptions like this. Reading it makes my eyes water and my sides hurt. To request a Fedco catalog, all you have to do is click on over here, and then call and leave a message with your name and address. They say it might take a few weeks to get it, but mine only took a few days. Have fun! Well. I am happy to report that the market was a success: Fisher did not get any brisket, Alex and I managed to resist buying an entire bag of cider donuts and split only one instead, and we came home not with radicchio, but with a frisee-like baby mizuna, which was an excellent second best. We also got eggs, and some bacon, and some Shy Brothers cheese. And although according to my friend Kristen fridges cannot actually talk, I could swear that while I was putting everything away the door was squeaking frisee ! salad ! with lardons, and a fried egg ! At least, that's what I heard. 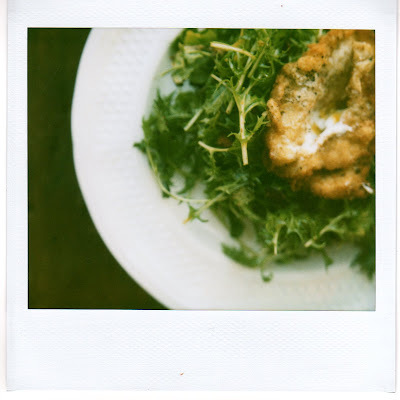 If you have never had a frisee salad with lardons and a fried egg, well, maybe that's why your fridge does not speak. Because once you have tried this dish, you and your fridge will be asking for it every day. In the summer, I eat it all the time. There's a frisee salad with lardons and a superbly tangy mustard vinaigrette and a nice panko-crusted fried duck egg on the menu at Blackfish, and I have found that if I ask very nicely at the end of my shift the kitchen will make me one. My friend Kerry has figured this out, too, and a few of the other girls, and we've discovered that sometimes, if we ask extra nicely, the kitchen will even make us a big bowl of it to share. Not always with duck eggs, but still. We have an addiction to feed. And over the winter, that addiction has been hungry. It has been angry and ugly and kicking and screaming and crossing its fingers and toes that we can just wake up already it will be May. Now that it's February and the days are a little longer and the birds are back and the sun is just a bit stronger, it's been seeming like it's high time to at least throw it a little tide-me-over here and there. And so today, at lunchtime, I got out the mizuna and a chicken egg and some bread crumbs and a few slices of bacon, and I got to work. It didn't take much. I fried the bacon in a skillet, poured off the grease, and fried the battered up egg in the leftover fat. Then I tossed the greens with a tangy mustard and shallot vinaigrette and crumbled up the bacon so it could fall through the leaves and then, when the egg was ready, balanced it on top. It was golden, and crispy, and from its perch, it had almost a proud, stately look. 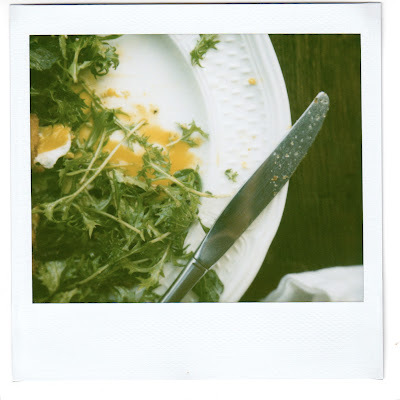 Then, when I cut in, the egg yolk burst all over the greens and coated everything in a rich, runny yellow. It was pretty magnificent. So go ahead, get your groceries or your mustard or go in with a neighbor on half a pig, just do what you need to do. Only don't wait as long as I did, or you might start to imagine that your fridge can speak. This recipes makes enough salad for two people. It is adapted, mentally speaking, from the way the frisee salad at Blackfish tastes, although it is fairly different. I like to eat it for lunch with a slice of toasted whole wheat bread and a little bit of Shy Brothers cheese, and then I like to make myself a second plate when dinner rolls around. Haul out a medium-size frying pan and get the bacon going. While it cooks, whisk together the shallot, mustard, olive oil, vinegar, and sherry to make the mustard vinaigrette, and season it with salt and pepper. If it is too tangy for your taste, add a bit more olive oil. Toss the greens with the dressing and set aside. While the fat heats up, crumble the bacon over the mizuna and toss the greens again. Divide the greens and bacon into two portions, and arrange each half in the center of a dinner plate. Then put the breadcrumbs in a small bowl and crack one egg in. Carefully roll the bowl around so that the outside of the egg is coated in breadcrumbs. When the fat is hot, use a slotted spoon to drop this egg in. Cook it for 10 seconds on each side and place the fried egg on top of one of the salads. (This timing yields a runny yolk. If for some reason you want a fully cooked yolk, add about 10 seconds to each side.) Bread and fry the other egg, and serve the salads immediately. And don't be afraid to sop up any extra yolk with some bread. Alex and I just wanted to pop in today to say that we are going to the second ( ! ) ever ( ! ) Cape Cod winter farmers' market tomorrow, and we very much hope to see you there. It's in Marstons Mills at Liberty Hall on Main Street, from 10am to 2pm. There will be all sorts of goodies, including, I'm told, apple cider donuts. I also have my fingers crossed for radicchio, and Alex is hoping for some new cuts of meat. Fisher, for his part, is praying to Dog that we'll leave a pound of brisket unattended in the backseat. To market, to market—with any luck, we'll see you there. Arthur Teubner lives in Truro. 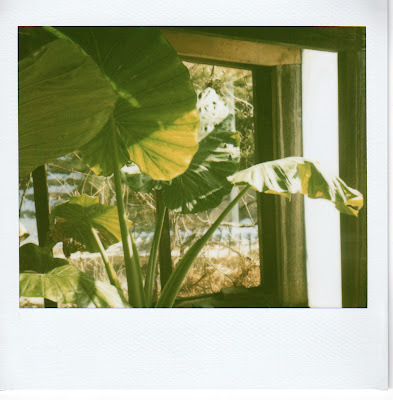 His roommates include one fig tree, one taro plant, a rosemary bush, a whole bunch of rainbow chard and spinach and arugula, and a potted banana plant. As you can see, it's very cozy in there. The coziness has a lot to do with glass, and the sun. In the seventies, Teubner volunteered at the New Alchemy Institute in Hatchville, and he got very into the idea of incorporating growing space into living space. The Institute was a research center studying organic agriculture and aquaculture and bio-shelters, and it created an indoor eco-system called The Ark. The basic idea was to build a greenhouse for both shelter and food, and to populate it with species that would compliment and regulate each other as they grew. It was very successful, and Teubner took the idea with him. He built his house about a decade later, with his own plans and hands and a lot of recycled materials. He designed it to sit on a south-facing slope overlooking his garden (which has since turned into a farm, First Light Organic Farm), and an orchard of fruit trees. It was an upside-down home with three floors: on top, a master bedroom and bathroom and study, in the middle a kitchen and dining room and living room, and on the bottom, an extra bedroom and an attached greenhouse. By building the greenhouse onto his home, he reasoned, he could grow warmer-climate crops or over winter native crops by regulating the temperature in conjunction with his living space. This seemed more sustainable to him than having a separate, independent structure that he would have to supply with nutrients and heat. But that isn't even the cool part. The cool part is that the way he did this was to incorporate the air from the greenhouse into his home. He cut power registers and ducts into the walls and ceiling of the greenhouse, so that if the sun creates excess heat, he can pull it into his home. He created heat sinks in the form of brick flooring and dark earth growing beds, and he built a row of cylindrical water columns to act as solar heat sinks. He also added a indoor fish pond that connects to an outdoor fish pond, so that the protein he raises can swim in or out depending on the weather or temperature or just what sort of an adventure it feels like taking that day. When the fish have been swimming and eating for a while, he takes the nutrient rich water from their pond to water the vegetable crops. 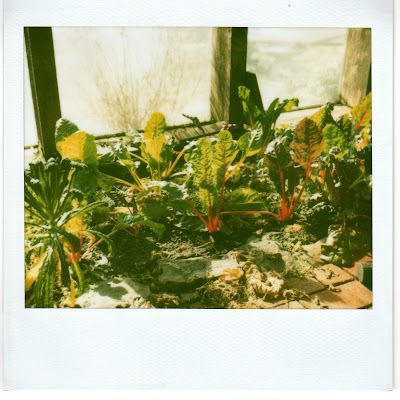 Finally, he planted grapes—Concords and a few other leafy varieties—along the east and west sides of the greenhouse. He trained them to grow up along the sides and over to cover the top, and in the summer, they leaf out. The greenery blocks the sun in the summer, keeping the greenhouse cool and shady. In the fall, the leaves drop, and the light is allowed back in. There are clearly a lot of good features to this indoor growing space. For starters, when he's cooking dinner, Teubner can sneak downstairs in his socks or even bare feet and pick a whole meal's worth of chard and arugula and thyme. He can also grow plants that normally wouldn't survive in this climate, like figs and bananas, because they spend the winter protected, inside. Lastly, and sometimes he thinks most importantly, when it is February or March on Cape Cod and the weather report says GREY for the seventy-second day straight, he has a warm, lush, almost Costa-Rican place to go. This insanity salvation, he says, is almost better than the fresh figs. 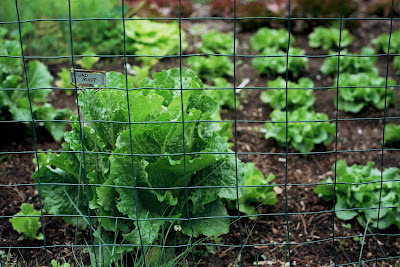 Of course, most of the year, his food production in the greenhouse focuses on leafy salad plants. The figs and grapes and whatnot come in a big September-October whoosh, and from there it's herb and cold crop time. 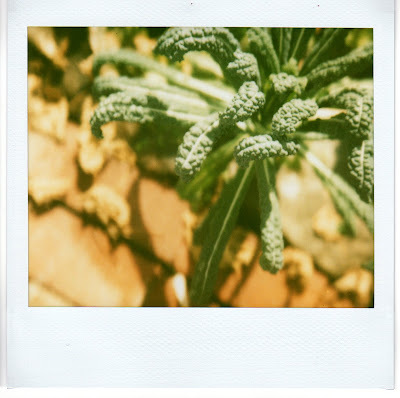 The day I visited, last weekend, he had Swiss chard, arugula, lettuce mix, spinach, and Dinosaur kale going on. It actually looked a fair amount like what we have in our not-so-toasty, unattached greenhouse right now, except that everything was bigger, and a bit healthier, and not looking quite so desperate for heat and sun. By the time I got home, I was trying to figure out how we could build a greenhouse onto the south side of our house and whether or not I would rather have a fig tree or a banana tree, or maybe even a lime tree, or if maybe I should just fill the beds with oregano plants. Of course, I was getting a little bit ahead of myself. In the end, I drew a lot of pictures and researched green design architects online and made myself a pot of barley and winter greens soup. A Costa Rica Room would be nice, one day. 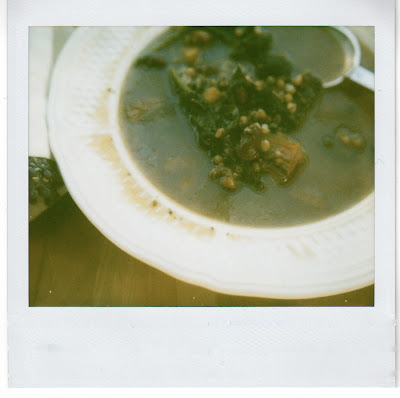 But in the meantime, the soup turned out to be cheap, and tasty, and a very good second best. As for the soup, it's excellent. It's adapted from a recipe I found the other day in the Feburary issue of Bon Appetit, now that I (ahem), finally got it back from my sister. Anyway, it's for a barley soup with kale, chard, spinach, fennel, lemon, and dill, which, as soon as I saw it, I knew was for me. I changed a few things, but the idea is the same. This soup is bright and light and hearty all at once, and in a much more wholesome way than the song, really and truly very fresh and very clean. There is something almost squeaky about it, in the same way that, say, lying in a mud wrap with cucumbers on your eyelids is. Best of all, it is an excellent first use for our brand new, New England grown ( ! ) barley. *The original recipe called for fresh herbs. If you're making this soup in the summertime, when fresh dill, fennel, and basil are readily available, I would certainly recommend swapping them in—1/3 cup each to replace the dried measurements. 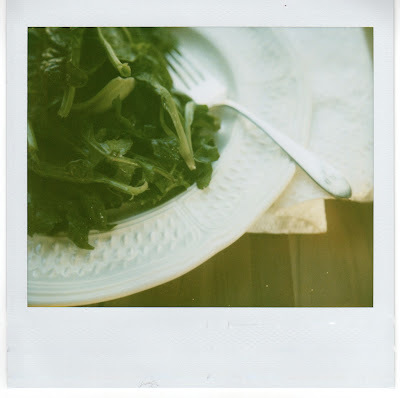 ** The original recipe also called for kale in addition to the Swiss chard and spinach. I think you could probably use any combination of winter braising greens you like—the more the merrier—with success. Bring the barley, 4 cups of the chicken stock, the water, and 1 teaspoon of sea salt to a boil in a large, heavy-bottomed pot. Reduce the heat to low, cover the pot, and leave the barley to simmer for about 45 minutes, or until tender. Meanwhile, pull out a skillet and heat the butter up over medium-high heat. Add the onions, stirring frequently, and cook for about five minutes. Sprinkle in the herbs, and season with salt and freshly ground pepper to taste. Continue cooking for about three more minutes, or until the onions are soft and translucent. Deglaze the pan with the wine, cook for a minute or two longer, and turn off the heat. Set the onions aside. When the barley is tender, add the remaining stock and the onions to the pot. Add the chard and the spinach, and simmer for about six minutes, or until the greens are tender. Season the soup with salt and pepper, and pour it hot into bowls. Put the cilantro, feta, scallions, and lime wedges on the table to use as garnishes. (The cheese doesn't matter too much, and the cilantro and scallions are sort of personal decisions, but whatever you do, don't skip the lime juice. It brings out the flavors of the greens and brightens the barley and the broth.) This soup is good on day one, but even better on day two, so don't be afraid to let it sit. Oh, and you are going to get a jar of slightly sweet yellow mustard out. Then you are going to slide around your kitchen in your wool socks listening to Harvest Moon and doing a little jig, because you are going to be uncontainably, terrifically happy. This is one of the side effects of eating soft, salty homemade pretzels dipped in good mustard, at least in my experience. 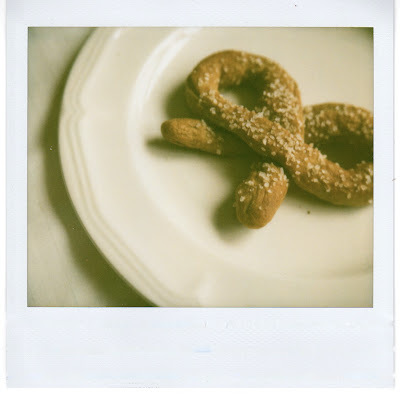 I made these pretzels last week, with my mother, after she sent me the link to the New York Times recipe. We were up skiing for a few days in Maine, with Alex's family and my family and all sorts of cousins and nieces and plenty of beer and helmet hair and hot-tubbing. I had never come across a recipe for soft pretzels before, but if ever there was going to be a pretzel-y occasion, this seemed like it. I did not make a single tweak to the recipe, so when you get in to your kitchen, do just as Pete Wells says. The only words of caution I have are that thirty seconds of poaching go very quickly, so be prepared and have a baking sheet on hand and a timer and a spatula ready. Also, get some nice mustard. Heinz is fine, but it is no Down East Schooner. Whatever you do, make these soon, and I'll see you when the laundry's done. 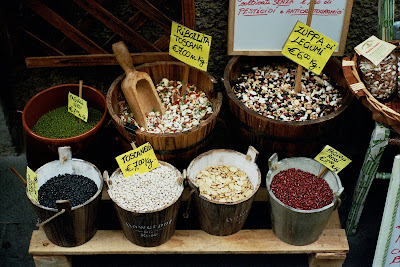 One of my favorite things about Italy was the markets. In the country house where we stayed—in Panicale, straddling the border of Umbria and Tuscany—we shopped at the local market nearly every day. We had eaten our fill of fancy shaved truffle pastas and Caprese salads in the city, and while we were in the country we intended to shop, and cook. The woman who ran the tiny store didn't speak a word of English, and we couldn't get very far on my two semesters of college Italian, but it didn't matter. We would point at cheeses and meats or chestnuts and artichokes, and she would either grit her teeth and tilt her hand from side to side or break into a wholehearted, approving grin. This was how we decided what to buy for dinner each day. At first we had a hard time finding the food vendors—outdoor markets in Italy apparently function more like department stores, the streets filling up with stands selling socks and hats and tights and children's costumes and housewares—but eventually, we made out a man with radicchio and endive and spinach and carrots, and from there the food wound on and on. 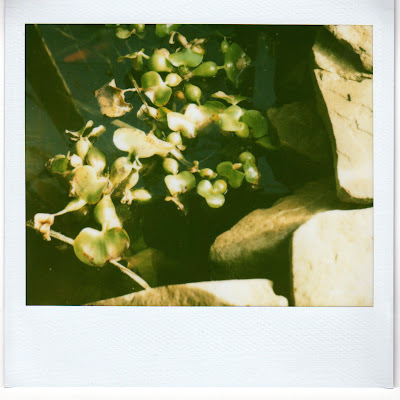 There were beautiful fruits and vegetables—artichokes and clementines and persimmons and every sort of olive imaginable. There was a man with wild boar sausages and another with dried fish and one with an entire table of hard cheeses and fresh breads. And then finally, way up top, tucked onto one of the highest cobbled streets, we found the grain and bean bins. And that was the first thing, I realized, that was really and truly different. Every other stall we had our version of in farmers' markets at home. We have the produce stands and the shellfish vendors and the meat guy and the cheese guy and the baker with a table full of breads. We have root vegetables and greens and fruits and granolas and even handmade pastas sometimes—but there is never, ever anyone selling locally grown grain, and only on the very rare occasion have I been lucky enough to find beans. When we got back from Italy—when I settled into my desk and started checking email and making my way through the 279 messages that had accumulated while we were gone—I found something very exciting in my Inbox. It was a message from Andrea, Andrea who you sometimes run into in the comments section of this blog, and she said there was something I should know about. A couple in Amherst was starting New England's first grain and bean CSA, and she thought I might like to take part. They had been full for a while, but they had just opened up a few extra shares, and if I emailed them quickly then maybe, just maybe, I could get a spot. So I sent an email, and we (phew!) got a spot, and last month, on a snowy Wednesday in January, I drove to Amherst to pick our share up. When I arrived, I had only a little bit of an idea of what to expect. I knew that the couple's names were Ben and Adrie Lester, and that they owned a bakery called Wheatberry on Main Street, and that this was where I should go. I knew that we would be getting grains A through K, and that there would be roughly one hundred and five pounds of them in all, and that I should come prepared to carry them out with six canvas shopping bags. I did not know that they had an absolute stunner of a little daughter named Ella, and that their bakery was secretly exactly like the one I hope to open one day in Wellfleet, with cream and milk from a local dairy and sandwiches made with local meats and cheeses and veggies and fresh baked bagels and pastries and baguette and rustic breads and some of the best pickles and chocolate chip cookies I have ever washed down. (Together, no less.) And, most importantly, I had no idea what grains A through K were. Since then, I've learned quite a bit. I've learned how to store whole grains—in cloth bags, downstairs in the basement where it's dark and cool. I've learned how to grind grains—by screwing this attachment onto our KitchenAid and playing around with coarse and fine grinds. I've also learned how to start cooking with things like farro and dent corn and spelt, and of course there will be more on that as the winter wears on. But what I've learned that I want to share most is simply what the grains are—what they're called and how they grow and what they grind down into and what we're supposed to use them for. We've gotten fairly out of touch with whole grains, especially the older, more unusual ones, and I think it might be nice to get reacquainted. So here goes—everyone, meet A through K.
B. Red Fife Wheat: This grain was grown right near Amherst in Belchertown at White Oak Farm, the main planting grounds for the CSA. It's a heritage bread wheat, and it's good at adapting to all sorts of growing conditions. It's named for a guy named David Fife, whose family developed the strain around 1842. The wheat kernel is reddish, which gave it the other half of its name. Farmers like it because it can grown in poorer soils, and many of the bread wheats grown commercially today can trace their lineage back to Red Fife seeds. Recently, it's been making a comeback on small farms, with help from the Heritage Wheat Project and placement on the Slow Food Ark of Taste list. It is an excellent milling grain and makes top notch bread. C. Hadley Wheat: This one is a bit of a mystery. I can tell you a few things about it—namely, that our particular harvest was grown in Hadley by a farmer named Alan Zuchowski, and that usually, his farm has grown tobacco. Tobacco did terribly this year, and so he was happy to have switched to wheat. He dried it in his barn, which has removable side panels that he opens and closes every morning and evening to let the light in and shut the dew out. Based on my milling experience, Hadley Wheat is a very hard variety, and is an excellent baking wheat, but other than that, I'm afraid I don't know much. I'm working on it, and I'll be back when I can tell you more. D. Spring Barley: Farmers classify varieties of barley by the seasons because some need to be exposed to cold and some don't. Winter barley, for example, must be planted in the fall so that the seedlings will be exposed to low temperatures. Spring barley, on the other hand, doesn't need the cold, and so can be planted in the spring. The spring barley in our share was grown at White Oak Farm, and whole, is excellent for cooking into soups and stews. It can also be used to make malt for beer, and once upon a time, it was such an important grain that it was used as currency. E. Zorro Winter Wheat: Winter wheat, like winter barley, is planted in the fall. It sprouts before the ground freezes, and then goes dormant until things warm up come spring. It needs the cold in order to flower, and so long as it gets it, it will be ready for harvest in early July. Winter wheats tend to be hard, which means that they have high levels of gluten, and make good flour for breads. (Soft wheats, on the other hand, tend to make better flour for cakes and baked goods.) The Zorro winter wheat in the CSA share was grown at White Oak Farm. F. Winter Rye: Umm, are you catching a theme here yet? Winter rye is another one of those winter grains, and is often planted in the fall as a cover crop because it forms a ground cover quickly and is good at all sorts of handy things like protecting fields against erosion, finding leftover nitrogen, and preventing soil compaction. What's interesting, though, is that although a lot of small farmers plant winter rye as a cover crop, not many go to the trouble of harvesting it, because up until recently, there hasn't been much of a market. With the growth of the local food movement, more farmers are starting to harvest and dry the grain. I haven't quite figured out yet whether or not there's a use for it whole, but ground, it makes a mean pumpernickel bread. The winter rye in the CSA share was also grown at White Oak Farm. G. Emmer: Remember this one from the other day? It's the grain I put in our soup, the ancient variety of wheat that also goes by the name of farro. 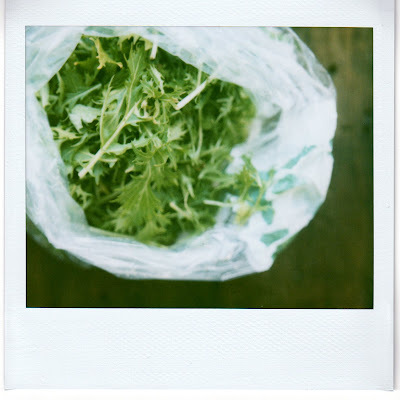 It's best used just as is, soaked whole and then cooked down in soups or for cold salads or maybe just with a little bit of butter and Parmesan cheese. It can also be ground down into flour for making pasta. Whatever you do with it, it is a little bit nutty and absolutely delicious. Our emmer, yet again, was grown at White Oak Farm. H. Dent Corn: When I picked up the share, this was the grain I was most curious about. It was big corn, in whole kernels, and I wasn't quite sure it would grind down. But apparently, dent corn has a lot more starch and not as much sugar as table corn, and it is soft, which makes it good for milling into cooking and baking grains like cornmeal and polenta and grits. Dent corn was a crop failure for the CSA, so Ben and Adrie bought it in from Eric Smith at Cayuga Pure Organics in New York. I. Black Turtle Beans: These small, shiny black beans (which are also from Cayuga in New York) are the ones you see in rice and beans in Latin America. They're the most common black bean, and they have a dense, meaty texture and plenty of flavor. I think we'll be putting most of ours into soups and grain/bean salads, and maybe a few burritos here and there. J. Boston Favorite Beans: Somehow, I do not seem to have brought any of these beans home. I can't tell you what they look like, or what they're used for, but if I had to hazard a guess, I would say they are good for making baked beans with onions and bacon and molasses. K. Oats: I am not going to say much here. Obviously, we all know what oats are, but the oats from our share (grown at White Oak Farm) are whole, not rolled. Since we don't have a means to hull ours, this means they will be going whole into dishes like this. Well. I'm glad we got that out of the way. Think of this as a first time meet-and-greet, and I think we can all look forward to bumping into these grains again, maybe a little bit more one-on-one, another day. In the meantime, just in case you get inspired to go to the health food store or the market or wherever and seek out a few of these whole grains (if you find any that were locally grown, be sure to let us know! ), I thought I might point you in the direction of a recipe. I made this the other day with our emmer, except with sweet potatoes instead of butternut squash and kalamata olives instead of toasted walnuts. It was absolutely delicious, and I have a feeling it can take all sorts of tweaks. Have fun playing around with it, and enjoy the weekend, everyone. Would you like to talk about pesto tortellini today? Good. Because while I tried, really I did, to cultivate an interest in chili dogs and men in tights and oddly orange jalapeño cheese dip, last night I failed only one beer in. I actually went to a separate room to sit sober and write wedding thank-you notes. It was a sorry, sorry state of affairs. These pesto tortellini, on the other hand, went much better. In fact, I think I'd even go so far as to say they were a tremendous, out-and-out, smash hit. They might have been slightly time-consuming, and a little bit finicky, but they made the best work lunch I have had in months. I don't say this about many things, but they tasted, in a good way, like they came from a box. So I think that instead of the Super Bowl, we should focus on them. I've been wanting these pesto tortellini for months, ever since we bought some in Charles de Gaulle on the way home from our honeymoon. They were outrageously expensive, and packaged in plastic, and drenched in cold, congealed, alfredo sauce, and somehow, they were superb. We had left our hotel in Rome without breakfast on what seemed, after the driving and the flight, like maybe another day, or even another trip, so that could have been it, and we were also headed onto an eight-and-a-half-hour flight. 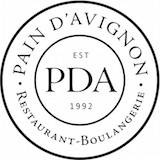 We had no food, and no idea that Air France is secretly a five-star restaurant that serves wine with your meal and cognac as an after dinner drink, and so we decided to stock up. We then astonished ourselves by eating the whole Air France plate and all of the tortellini, and declaring it far and away the most enjoyable in-transmit meal of our lives. When we got home, I did not forget the experience. I craved pesto tortellini the way I wished we were still in Paris, and they both seemed equally out of reach. And then on Christmas day, my parents gave Alex and me a beautiful, hardcover, full-color Italian cookbook. 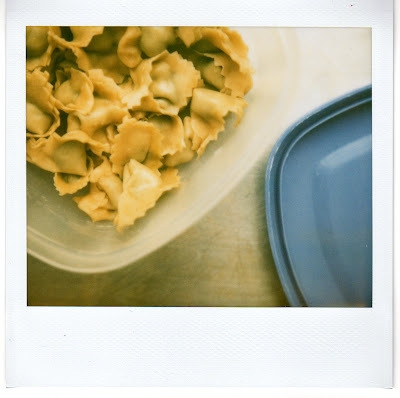 It took me precisely one month to reach the page that showed a man folding squares of pasta into tiny, handmade tortellini, and exactly two hours longer to get to work. Once I finished, I had a hard time remembering what had seemed so daunting in the first place. It couldn't have been the pasta dough, because I've rolled out fettuccine and spaghetti and even angel hair plenty of times before. It most definitely couldn't have been the pesto, seeing as our (new! accurate!) freezer inventory sheet clearly states that we have a whole seven cups of basil and Parmesan and pine nuts and garlic already whipped up. It must have been the cutting, and the folding, and the squeezing, which as you can see was a terribly silly mistake. Tortellini, as it turns out, are very much within reach. My reach, and your reach, and your grandmother's reach, and even your ten-year-old son's. They are a project, yes, but a fun one, and especially delightful because you get to eat your results. That is always an excellent criteria, I think. So if you don't mind, I'm going to show you some pictures and give you some instructions and turn you loose. Measure the flour into a large mixing bowl. Make a well in the center, and crack the eggs into the hole. Mix the eggs with a fork, whisking carefully, and slowly begin to bring in some flour. Continue whisking flour into the eggs until the mixture gets too thick to whisk; then work the eggs and remaining flour together into a dough using your hands. If the dough is too dry, add water, but take care not to go overboard. A good dough is moist but it should never stick to your fingers. (If it does, it will also stick to the pasta crank, and you will have quite a mess on your hands.) Knead the dough on a lightly floured counter-top until it is completely smooth. Break off a small, fist-sized piece; cover the rest with plastic wrap and set it aside. Use a pasta crank to roll out the dough into a long, thin sheet. (We have this machine, and I usually pass it through settings one through seven before I decide it's thin enough.) Lay the sheet of pasta out flat on the (still lightly floured) counter-top and cut it into one-and-a-half-inch squares using either a knife or, if you have one, a pasta bike. Use a 1/4-teaspoon measuring spoon to scoop a tiny dollop of pesto into the center of each square. 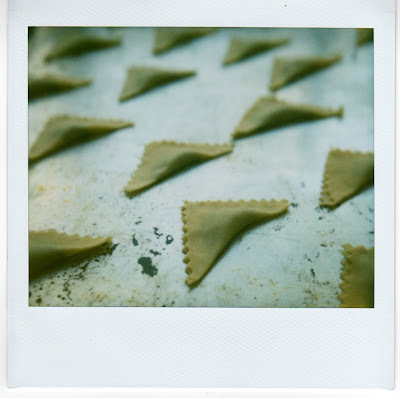 Working quickly so that the pasta does not dry out (if it does it will no longer stick to itself easily), gently fold the squares into triangles. Press the two open edges of the triangles together to seal the pesto in, taking care not to push the filling out. Now comes the fun part: fold the bottom two corners of the triangle together and squeeze so that they stick, and congratulate yourself on making your first batch of tortellini. Continue repeating this process—rolling out a thin sheet of dough, cutting it into squares, and filling and folding them, until you have either exhausted yourself or used up all of the dough and pesto. If you have extra dough, you can wrap it in plastic wrap and it will be fine in the fridge for a day or so. If you aren't ready to cook them yet, the tortellini will also be okay in a Tupperware for a few days, although they might stick together a bit if they're still moist when you throw them in. If you are ready to cook the tortellini, bring a large pot of salted water to a boil, and drop them in. They will cook very, very quickly—in a matter of one or two minutes, three tops. Watch them carefully, tasting every thirty seconds or so for consistency, and when you have the pasta where you like it turn off the heat and strain them through a colander. Serve hot, tossed with just a smidgen of olive oil or butter so they don't stick and, if you like, a dusting of Parmesan cheese. Green, in February, is a very welcome sight. It is especially welcome when it comes in the form of Chinese cabbage and pak choi and pea tendrils and crispy crunchy salad mix, and when it finds its way through a shower of creamy balsamic dressing onto my lunch plate. When it does that, it feels a lot like an August house guest who washes their own towels and sheets and makes the bed and empties the dishwasher before they leave. As in, it's a you-can-stay-forever-if-you-like! sort of a thing. Generally, I'm a sucker for brighter colors like reds and yellows and oranges, but this time of year, I think they're a little overdone. Greens are the new heirloom tomatoes, or the new juicy peaches—that kind of thing. You know, at least they aren't winter squash. I think everyone can agree on that. Not that winter squash is such a bad thing. It's just that, especially in leap years when Punxsutawney Phil sees his shadow and you're going to have not just six more weeks of winter but actually Six Weeks And One Day, anything with the word winter in it starts to get a little old. Which is why it was nice that when I went to the Plymouth Winter Farmers' Market a few weeks ago, Silverbrook Farms had a good supply of greens on hand. Actually, one other stand—the one I mentioned the other day, Allen Farms—had greens as well—pea tendrils—but those were the only two. (Everyone else had important things like storage onions and carrots and granola and bread and cheese and potatoes and winter squash, which I probably should have bought more of since the greens lasted all of a week, but sadly I did not.) Instead I picked up a bag of pea tendrils from Allen Farms and then headed over to chat with Bianca Meleo who was standing in front of the pak choi and lettuce mix and Chinese cabbage over at Silverbrook Farms. It turns out the greens were sort of a last-minute, fast-growing thing for them—something they've experimented with in the past, but that they just started seriously for the winter market this fall. Bianca's the farm manager, and the one you see at the markets alongside Andy a lot, and she's also a newly converted winter greens nut. After the terrible growing conditions in June and July, this winter's actually been better than the summer was for things like lettuce and cabbage and spinach, she says. She was telling me about how they keep they crops warm—how they plant them inside in greenhouses, but without any heat, and then cover them up with frost clothes to prevent moisture from landing on the leaves. This is what kills them—this getting wet and freezing. It actually isn't the cold temperatures, unless it gets so chilly that their roots freeze, which is pretty rare. We also spent a lot of time chatting about what Bianca likes to do with the greens, which recently, has been very much focused on a pak choi-chicken combo, with avocado spread on sandwiches and peanut oil in stir-fries. She says it works because the pak choi is a little bit nutty, but also a little bit sweet. We talked about pak choi for so long, in fact, that you might have heard us talking about it on the radio today, right before my producer said something about me having a recipe for chinese cabbage and pak choi stir-fry for you today. Following a rather disheartening mishap involving a box of cornstarch and waaay too much white powder dumping into my wok and a tearful meltdown that I'd rather not discuss, that recipe is still a work-in-progress. So instead, what do you say we talk about that creamy balsamic dressing I mentioned up top instead? 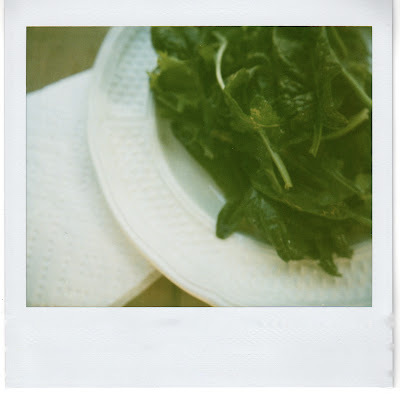 Because that has never let me down, and it is an equally good way to dress up your plate with green. In fact, beyond Bianca's winning description, I don't know why I ever mentioned anything about pak choi stir-fries in the first place, because this dressing has been on my plate every day at noon for the past fourteen days straight, ever since I stocked up on greens at the Silverbrook Farms and Allen Farms stands. It takes all of about three seconds to make, and best of all, it is so good and so simple that drizzled over a bowl of top quality, sweet, winter greens, the two make a salad without any need for anything else. It isn't at all fussy, and it certainly doesn't involve a wok or any cornstarch. Instead, it gets its thickness from heavy cream and a sweet, oozy balsamic glaze. The only other ingredient is olive oil, preferably a green, spicy, newish variety like the one we brought back from Italy, and then if you like, a pinch of salt. You mix everything together with a fork, the cream acts as an emulsifier and binds everything into a light brown, creamy river the exact color of a nice pair of suede boots, and that's it. You're done. So the next time one of these winter markets is open—the one in Plymouth, or the new one starting this! Saturday! in Marstons Mills, or even if you live a little further afield the well established one in Providence—keep your eye out for the little green patches. Then buy out the supply as quick as you can and ask in your most fervent tone for them to Keep On Planting More. This is so simple that I am a little bit embarrassed to offer it as a recipe, but what it lacks in grandeur it makes up for in taste. The important thing is to make sure that your base ingredients—since there are only three of them—are of top notch quality. The olive oil should be a greenish, almost spicy extra virgin, the newer the better. The balsamic glaze is that thick, syrupy balsamic you see at specialty food stores that costs an arm and a leg but is worth it because it goes a really long way. (We use a brand called Acetum that we found at Phoenix Fruits in Orleans.) As for the heavy cream, don't do something silly like substitute half and half. The consistency will be all off, and the dressing won't emulsify like it should. If you get the ingredients right, though, it's very hard to go off track. The measurements below are just approximate, so go ahead and experiment with the proportions until you get it to taste. I tend to do it by eye, so it changes every day. Combine the first three ingredients in a small measuring cup, and whisk them together until they form a thick, creamy dressing. Add a pinch of salt, taste and adjust as necessary, and once you have the dressing where you like it, pour it over a big bowl of salad greens. Toss well, and serve at once. I am a firm believer in the power of soup. A good soup, I am thoroughly convinced, can fix a lot of things. And in the past few weeks, I've heard of quite a few people in need of help. For starters, there's Alex. We spent yesterday in the emergency room at Cape Cod hospital. Everything is fine—he just got boarded at his Sunday morning hockey game is all—and they thought he might have broken his clavicle, or maybe a few ribs. But he didn't, and although it hurts when he breathes deeply and his arm is in a sling and he is acting just the slightest bit loopy from all the vicodin, in the big scheme of things, he is a-okay. Groovy, really, compared to what could have been. There have been other people we know, too, weathering more difficult things. There's my mother's friend who just had a (successful! curing!) double mastectomy, and Alex's aunt who just survived open-heart surgery. But of course, none of these really compare to the main event going on down in Haiti. Figuring out how to respond to a crisis like that is going to take a lot more than soup. There is so much to do in Haiti that it's hard to know where to start. People injured in the earthquake need medical help, of course, and food and water most urgently. Children need to be reunited with their families and parents need help searching for aunts and uncles and brothers and sisters and grandparents. Even more overwhelmingly, in the long term, a whole society needs to be rebuilt. This will take money and materials and laborers, and it will also take time. Internationally, everyone will contribute what they can, and eventually we will get the job done. But in the meantime, it's hard to know what to do. Nothing heals overnight—not a country of survivors, or a broken nose, or an opened-up heart. I'm not much good at flowers, or get-well balloons, or even always cards, but I can always make soup. I made a batch this weekend—sautéed onions and carrots and mushrooms and sausage with a rich red wine and beef broth and thick blooms of kale and red kidney beans and farro hanging about. I brought some over to Alex's aunt, and I sent the recipe to my mom to make for my dad, and I heated Alex up a bowl when we got home from the hospital last night. If I could send an extra large pot down to Haiti, I would. It isn't much, I know, but it's what I know how to do, and it comes with the best of hopeful thoughts in mind. 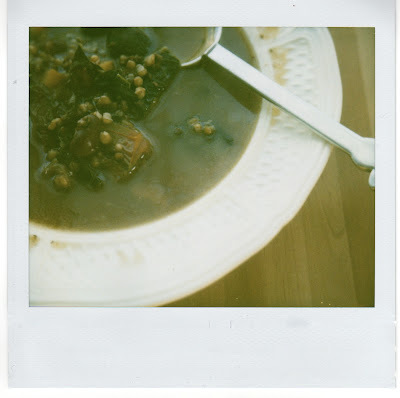 The thing I like about this soup is that it is both delicious and truly good for you. There isn't an unhealthy bone in its build—unless you count the sausage, which I don't so long as it comes from a pastured, anti-biotics-free pig. The only unusual ingredient is the farro, an ancient variety of wheat also known as emmer. We discovered it through the grain CSA we joined this year (thanks to Andrea! more on that soon! ), but it is also fairly readily available at health food stores. If you can't find it locally, barley would make a fine substitute. Also, we used ground pork sausage for the meat, because that was all we had, but I have a feeling if you had something more Italian sausage or kielbasa-like, it would make an excellent replacement. Oh! and one more thing: for the mushrooms, we used dried and then rehydrated shiitakes from Julie Winslow, but any other dried mushroom with the same depth of flavor and heft, like a porcini or an oyster, would be fine. Heat up the oil in a large, heavy-bottomed soup pot. Sauté the onions over medium-high heat for about five minutes on their own, then turn the heat down to medium and add the carrots, the garlic, and the rosemary. When the vegetables have taken up most of the oil and the onions are translucent, add the sausage. Wait a minute or so until it starts to brown, then add the mushrooms and salt and freshly cracked pepper to taste. Continue cooking, stirring frequently, for another three minutes or so, until the mushrooms soften and the sausage is cooked through. Add the crushed tomatoes, the red wine, the beef broth, and the farro, cover the pot, and bring the soup to a boil. Turn the heat down to simmer and continue cooking, stirring and tasting occasionally, until the farro is almost tender, about 45 minutes. At this point, add the kale, and season the soup again with salt and freshly cracked pepper to taste. Simmer the soup, still covered, for another 15 minutes or so, or until the farro is soft and chewy. Serve the soup hot, and if you decide to go for the cheese, sprinkle it on top.